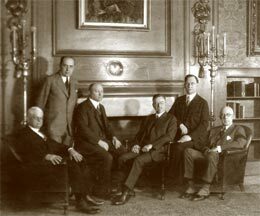 The building committee posed for this photo in their newly completed Library in 1926. In the last quarter of the 19th century, America’s medical community recognized an increasing need for medical libraries where medical books and journals were assembled for the use of all. Usually, such collections were established as part of a local library, but medical societies in a few cities, such as Boston, New York and Philadelphia, had free standing medical libraries. From 1870, the physicians of Cleveland had placed medical literature in the Case Library, a private library just east of Cleveland’s downtown public square. On the evening of November 27, 1894, a group of physicians representing the Cleveland Medical Society, the Cuyahoga County Medical Society, and the Society of the Medical Sciences gathered for the purpose of establishing a formal medical library... Before the evening ended, the Cleveland Medical Library Association was born. Several of the founding members made significant gifts of money to assure that the new library would be a stable and on-going enterprise. In its first years, the Library Association continued to occupy a small space in the Case Library, but in1898, the Association purchased the Henry Childs residence on Prospect St., a short distance from the center of the city. With continuing strong support in the form of money for operation and for endowment, especially a major endowment from Dudley Peter Allen, a principal founder of the library who died in 1915, the Association was in an excellent position. With this stability, additional property adjoining the Childs’ residence was purchased in 1919 with the thought of erecting a new building for the Library. By 1922, the Association engaged the noted Cleveland architectural firm of Walker and Weeks to prepare plans. When the plans were shown to Mrs. Elisabeth Severance Prentiss, widow of Dr. Allen, she offered significant funding for the new building under the conditions that its location was farther from town and it was named for Dudley Peter Allen. At this time Western Reserve University’s medical school (now the medical School of Case Western Reserve University) was about to move from its downtown location to University Circle where it would be adjacent to the University. Lakeside Hospital, associated with the medical school, was about to make the same move. Eager to have a medical library close to these institutions, the University invited the Library Association to build its new building near the medical school. On November 13, 1926, the Allen Memorial Medical Library was opened at the corner of Euclid Avenue and Adelbert Road., a short walk from the school and the hospital. The building was designed by Frank R. Walker and Harry E. Weeks, noted for their excellent work throughout the mid-West and particularly in Ohio. In Cleveland, they left the largest legacy of important buildings of any architectural firm in the city’s history, including the Federal Reserve Bank, the Cleveland Public Library, Severance Hall, and the Allen Library. Although they worked in many styles, they were leading exponents of the classical revival in the 1920s and the Allen has been called “ Walker and Weeks at their best.” This neoclassical building was inspired both by French and Italian Renaissance models and by the monuments of antiquity. In 1983, the Allen was entered in the National Register of Historic Places. Rapid collection growth had characterized the Library since its founding. In spite of the Depression years, the Association never lost site of the fact that the collections were what it was all about and sufficient money was always available for purchases. Within ten years of opening, the Allen boasted of a collection of 50,000 volumes, with 430 periodicals arriving every month from all over the world. The Library was on its way to becoming one of the leading medical libraries in the country. In addition to being the home of the Library Association, the Allen was, for many years, the home of The Academy of Medicine of Cleveland. The Academy occupied the west side of the first floor, and shared the first floor auditorium and dining facilities in the basement with the Association. The Allen Library became the temporary home for the rare books of the Army Medical Library (now the National Library of Medicine) in 1942. The move from the Washington area was prompted by the war and a fear that these treasures might become the victim of the same destruction occurring in Europe. Seventy-five tons of materials arrived, and the Cleveland Branch of the Army Medical Library took over most of the third floor of the Allen Library, where it remained until the early 1960s. The Library Association also had a rare book collection that was rapidly expanding. The first book that the Association owned (a gift in 1893) was a rare mid-16 th century anatomical study by Andreas Vesalius. Gifts and purchases, including a special 50 th anniversary drive in 1944 to augment the rare book collection, resulted in a sizeable rare book collection within the Library. Continued attention to the collection in following years has led to a collection today that is among the finest in the country. At the same time the rare book collection was emerging, a collection of historical medical artifacts was also taking shape. Dudley Allen was a proponent of this collection, and when Dr. Howard Dittrick was put in charge of the emerging museum in 1915, the collection grew rapidly. He amassed a collection that would be impossible to duplicate today. The Dittrick Medical History Museum, named for Dr. Dittrick in 1944, is a leader in the field . The establishment of an Archives of Medical History, emphasizing Cleveland and Northern Ohio, occurred in the 1960s. These three historical collections are known today as the Dittrick Medical History Center. The 1950s and 1960s brought more change and growth to the Library. A professional staff replaced trustee committees that previously operated the Library with very limited assistance. The close proximity of the Allen Library and the University’s medical school, assured a close relationship. In 1948, the medical school established a central medical library which they had not had before, and in the late 1950s, the Association and Case Western Reserve University began discussing mutual concerns regarding library needs and development. By 1960, the talks focused on how the libraries could formally work together operationally and administratively to the advantage of both. As a result, the two institutions entered into an agreement to operate their respective medical libraries as if they were one. Shared staff, shared purchases, and operational integration created a more efficient and cost effective library that was well prepared to enter the fast approaching electronic age. Together, the two libraries were named The Cleveland Health Sciences Library. The integration of the two libraries was further enhanced in the late 1990s when the Association and the University renewed the agreement binding them. Additionally, the Dittrick Medical History Center became part of the College of Arts and Sciences in 1997, and thus has been further integrated into the life of the University.